Osteoarthritis is inflammation and loss of cartilage between bones leading to joint pain, stiffness, and swelling. Osteoporosis is the loss of bone mass leading to weak bones that are more susceptible to fractures. Physical therapy can help improve deficits caused by both of these conditions. In the world of bone and joint health, there are several different types of “osteos” that a person may hear about. When being diagnosed with osteoarthritis, osteoporosis, osteopenia, etc, it can be confusing to know what the difference is, and the details of your condition. Though these diagnosis share a common root, there are major difference in the nature of these ailments. Osteoarthritis is an extremely common condition that involves inflammation, loss of cartilage and even damaged joints in between bones. Osteoarthritis is a result of wear and tear on the body. 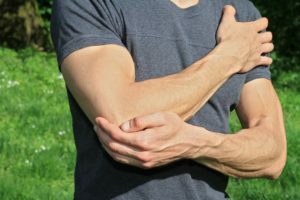 Over time, the nice, fluffy cartilage that exists between the joints of the body begins to deteriorate, resulting in less shock absorption through the joints, especially weight bearing joints. This can cause pain, swelling, and reduced movement. Knees that pop with every squat, a shoulder that grinds when you reach overhead can both be a result of osteoarthritis. Osteoarthritis can usually be detected by a simple X-ray that can show any degenerative changes that may have occurred. Osteoporosis is when the bones become very weak and brittle. The body begins to lose bone and not make enough to sufficiently replace it. Reduced bone mass and porous bones can increase the susceptibility to fractures. People with osteoporosis are more likely to experience compression fractures, which can be extremely painful. After women go through menopause, their bodies produce less estrogen—an important bone building hormone. This can increase the risk for osteoporosis. Additionally, smoking and some medications like certain breast cancer drugs can increase the risk for osteoporosis. While fractures, including compression fractures can be detected on an X-ray, if your doctor suspects you have osteoporosis, they will most likely order a bone density scan to determine the extent of bone loss. A common misconception is that when faced with degenerative joints and osteoarthritis or weak bones with osteoporosis, the best treatment plan is to limit activity. 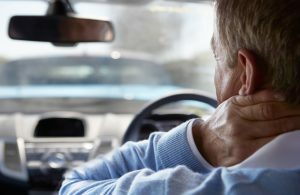 In reality, limiting activity not only does not help pain associated with osteoarthritis or osteoporosis, it can actually make these conditions much worse. Physical activity can help keep muscles strong to place less stress on the bones and help promote bone remodelling. A physician can work with you and may prescribe anti-inflammatories for pain and medication to help prevent bone loss for osteoporosis. Physical therapy can be a beneficial tool in combating both osteoarthritis and osteoporosis. 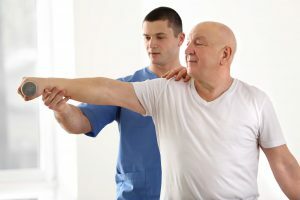 Physical therapists are trained movement specialists who can not only help strengthen weak muscles but analyze movement patterns to identify body mechanic deficits that increase stress on bones and joints. Do not allow pain from osteoarthritis or osteoporosis to keep you down any longer. Our university trained therapists offer timely appointments to help you combat these conditions, decrease your pain, and improve your overall function. Give Bourassa and Associates Rehabilitation Center a call today to see how we can get you back to the things you enjoy.